That drinking water at meals is harmful is another tradition to which some people still cling. There may be certain pathological conditions that would make this practice harmful. But people in normal health suffer no ill effects from a reasonable amount of water taken with meals. A safe rule at meals is to drink when you are thirsty, and with one limitation not to drink when masticating. The digestion of starch foods should begin in the mouth and this can take place only when the food is thoroughly mixed with the saliva. If food is mixed with water the salivary glands are not sufficiently stimulated to action, and the food passes from the mouth without enough of the digestive juice. One disadvantage of drinking water at meals is that people who do so often think they have a sufficient amount and do not drink between meals. Copious water-drinking is essential for proper elimination. 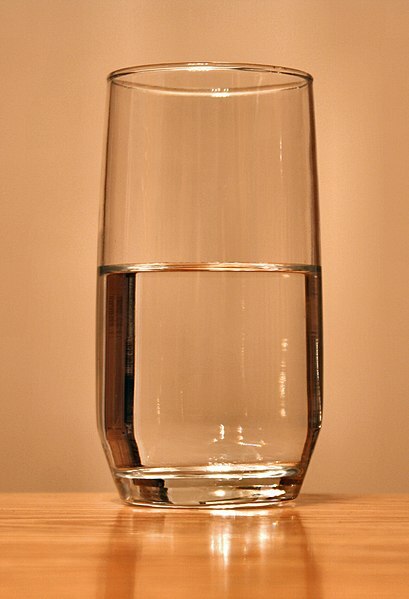 It is a safe rule to take at least six glasses a day, including that taken at meals, and ten glasses are not too much. What an appropriate post for today, as the whole of the Texas coast goes nuts stocking up on water prior to tropical storm/hurricane Harvey’s landfall. It’s too soon to know what the storm is going to do, but it’s not too soon for another reminder that water’s important for health. It is funny to read that some people thought drinking water with meals wasn’t a good thing — I never had heard that before. I hope that the storm isn’t too bad. My thoughts are with you and others along the Gulf coast. I agree with you, and not sure if it’s because I heard it wasn’t good for you (this post’s advice certainly had legs!) or more likely because I just didn’t like the combo. To this day I only set out water for dinner when I have company over. I never drank soda growing up, so it wasn’t that I had that with meals, either. Nowadays, a glass of wine sometimes! 🙂 We never drank soda growing up, either, but our mom insisted we have a glass of milk with meals. When I grew up I learned I had developed an allergy to milk so now water is all I drink. Maybe a glass of wine with company! Barbara, I drank a LOT of milk too, but now due to reasons (largely Big-Agri), have become mostly dairy-free. (Thanks for going over to my blog 🙂 ) Full disclosure: I also drank a lot of Hawaiian Punch! Full disclosure: My family drank a lot of kool-aid back in the day. We also always had a glass of milk with each meal when I was a child – though, since I grew up on a dairy farm, at the time I never really about whether other families drank as much milk as we did. Seems like when I was a kid, all kids drank a glass of milk with every meal. The exception in our house was the summer when, when it was really hot, we could have ice tea. My parents bought instant ice tea. Otherwise it was milk three times a day for meals. It seemed to be something that was done universally. I don’t remember my parents drinking much milk, however. My father would drink ice tea or instant (decaf) coffee with dinner and my mother was always partial to tea. That may be why I sort of associated drinking milk (and I’ll confess I don’t like milk much as a beverage) with being a kid, which is probably completely unfair. My father would occasionally buy buttermilk which was always sort of a treat, and which he liked. This reminds me that I just bought some and haven’t opened it yet. . . . I better do that. My mother would drink milk – though my dad never did. We used to tease him about being a dairy farmer who didn’t like the milk. Pretty good advice. Even a century later. Still good advice…and the rationale for it is impressive. I agree! It intrigues me how recommendations like this one are built on a strong rationale–yet the logic behind the rationale has changed across the years. Advice that remains pretty much spot on today. My suspicion is that the “drinking water at meals is harmful” belief was a hold over from Europe where, even at that time, water often was dangerous. Not because water itself is dangerous, but polluted water is dangerous. The lousy condition of European water, for eons, gave rise to the beer drinking cultures of northern Europe and the wine drinking cultures of southern Europe, with prodigious quantities of both being consumed in that era. It wasn’t really until after World War Two that European water started to really be cleaned up. I wouldn’t be at all surprised if you were right about that, Pat_H. We are very lucky to live in a time when many more people have access to clean, safe drinking water than previous generations did. Hopefully this will become something that everyone has within our lifetimes. It’s sad that many people even today do no have access to clean water. Now that you mention it, that makes sense. There probably were lots of issues with polluted water back then that had health implications. I know that the town I live, which was founded in the 1890s, used to have outbreaks of typhus prior to World War One that stemmed from well water used in town. And it wasn’t a big town. Big cities really ran that risk in the poorer sections. Medieval European texts used to warn of “creeping things” and the like making water dangerous. The attention that goes into making beer and wine, probably combined with the effect of alcohol (which is of course a poison) made drinking it much safer. During the Middle Ages some enormous amount of alcohol was consumed by many people on a daily basis as a primary drinking liquid. Dangerous water, no pasteurization for milk, etc., made it the safest bet. Even as late as the middle 20th Century the amount of calories contributed to European diets by alcohol was pretty high. American consumption, for that matter, wasn’t inappreciable for much of the 18th and 19th Centuries. It’s fascinating to think about how much our food consumption practices have changed as a result of improved sanitation. I did a post several years ago on Sanitation and the Prevention of Epidemics that you might find interesting. Now there’s a thought. Always something new even though old. I like how you put that. I often think about it from the opposite perspective (something old in the new); but you’re absolutely right, there is also new in the old. It is fascinating how there were recommendations about how much water to drink each day back then. I’m smiling.😄 I chuckled over the chewing while drinking water, I’ve done that when the chicken breast were to dry to swallow as a child. Maybe a component of good advice is that it will stand the test of time. My grandmother refused to drink water, or any other liquid, with her meals. Now I guess I know why! It’s really interesting how ideas about whether people should drink water as part of their meals have changed across the years. Yikes, I would struggle with 10 glasses of water a day. As kids we had milk after our main meal. We mostly had water as a thirst quencher between meals. When I was a child, the kids had 2 glasses at each meal – one filled with milk and the other with water. I don’t remember that there were any “rules” about when we drank them–as long as the milk was gone by the end of the meal. So interesting! My great grandpa believed that you should only drink liquids, milk or water, after finishing your meal. He was born in 1901. He probably had opinions similar to the author of the hundred-year-old book about possible problems with drinking water (and other liquids) with a meal. I think so. I wonder who came up with that unusual worry? Who knows? . . . some things from the past just remain a mystery. That is interesting. I thought that “drinking more water” was a modern phenomenon.